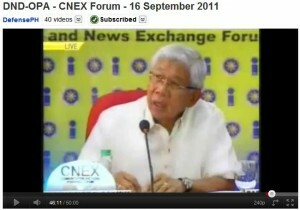 The Department of National Defense organized a Communications and News Exchange (CNEX) forum on the 16th of September 2011 at the Public Information Agency building in Quezon City. The following day, the Office of Public Affairs posted the video on YouTube. Present that day were the Secretary of National Defense, Voltaire Gazmin, GEN Eduardo Oban, CSAFP, and two members of his staff. It was an interesting glimpse into the dynamics of the press room. The SND’s opening statements clearly were crafted to steer questions in the direction of the AFP modernization program and build up territorial defense capability. Things however did not turn out that way. Internal Security Operations (ISO) remained top-of-mind for the press. Questions started with peace talks with the CPP-NPA and Jemaah Islamiyah. Afterwards the bulk of the questions centered on the re-arrest of MGEN Carlos Garcia for violations of the Article of War. The SND and his staff were clearly prepared for this eventuality with the presence of the Judge Advocate General, BGEN Gilberto Jose Roa. However this, and the other lines of questioning that prevailed, failed to maximize the presence of Maj. Gen. Roy Devartadura, Deputy Chief of Staff for Plans (J5) and the former head of the AFP Modernization Office. As the forum wound down, the PIA fielded its own reporter into the fray: Gideon Kapayaw. As of writing, it is unclear if he took to the floor to shift the balance of questions back to the AFP modernization program, or if he was tasked to focus on a line of questioning that was oriented towards the DND’s external defense obligations from the start. Regardless of his intended role, his question was . . . awkward . . . in a general sense and good fodder for this blog. Unfortunately, like a moth to the flame . . .
PIA: What are the marching orders of DND from our president ever since the Beijing visit? The resulting response was a simple re-statement of the AFP’s mandate to defend the republic, and a clarification that no new instructions were issued specifically as a result of the Beijing visit. 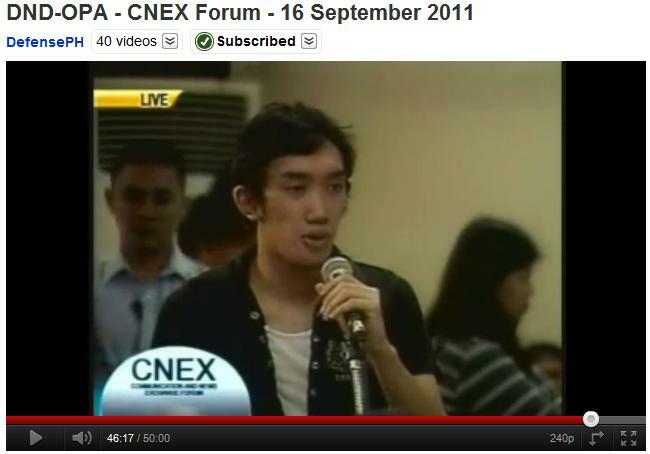 The second half of his question to CSAFP Oban was ignored. Everyone gets nervous, and gets the better of everyone at one point or another. Most of us, however, are lucky enough not get such moments on camera. Nice try Mr. Kapayaw. The SND’s opening statements seemed to fall on deaf ears. While a lone question about the establishment of a National Coast Watch System did come out, it appeared that the reporters present already had their “marching orders” about what details to report upon. The J-5, a man many a military enthusiast would arguably give an arm to speak with, barely got a word out. Ultimately, the press gets to decide what is news worthy and what isn’t. They have their reasons (e.g., target audience, ratings, etc.) for their focal points. Given this fact, it begs the question: If the DND really had a specific point that they wanted to get across, why not write their own article, post it on their Websites and numerous Facebook accounts, and just copy-furnish the press? That way even if the report doesn’t match up with the press’ priorities, it still gets to the people. This entry was posted in Public Information Agency (PIA) on September 23, 2011 by adroth.